When many people talk about their lives, disorganization seems to be a common theme. Keeping track of important dates, special events and all the other aspects that shape our lives is not always easy. While digital technology has made life better in so many ways, there are some things a computer, tablet or smartphone just can’t do. For those plagued by disorganization on a daily basis, a 2013 printable one page Excel yearly calendar template could be just what you need. This calendar template is designed so that it can be used by anyone at any time. It can provide the reminders you require while also giving you freedom and flexibility. In addition, the 2013 printable one page Excel yearly calendar template is absolutely free and can be downloaded instantly. The 2013 printable one page Excel yearly calendar template is fully functional and very easy to use. All 365 days of 2013 are laid out on the screen in four rows of three months. Each week begins on a Monday and ends on a Sunday. However, the calendar can be customized however you desire. There is also no restriction on the amount of calendar templates you can print off. You could print an entire stack and place them in the home or office so they are always there whenever you need them. The 2013 printable one page Excel calendar template is just part of our vast collection of complimentary calendars, calculators and spreadsheets that are designed to make your life just a little bit easier. 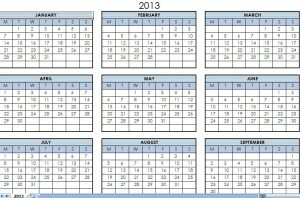 You may also like this free 2013 printable calendar in Excel template. Where can I get a 2012 one page calendar?